In the years 1996 and 2000 tuvinean shamans visited Europe in two delegations. This intercultural exchange was realized by the efforts of the Foundation for Shamanic Studies Austria. Both delegations were led by Dr. Mongush Barachovitsh Kenin-Lopsan, a specialist of tuvinean shamanisms and a shaman himself. Since 1993 the Foundation for Shamanic Studies is in contact with tuvinean shamans, its efforts culminating in the first visit of a tuvinean delegation of shamans to Europe in 1996. The first delegation the shamans Saryglar Borbak-Ool (deceased), Oleg Toiduk (deceased) and Kyrgyss Chawandajewitsch (deceased) conducted sessions and readings. 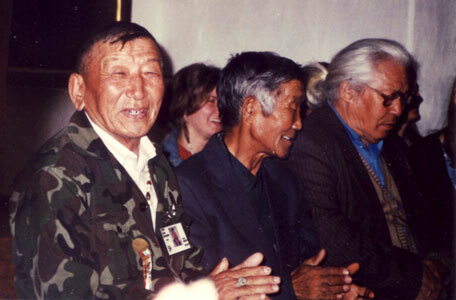 The second delegation visited Europe in the year 2000 and beside Dr. Kenin-Lopsan the shamans Saryglar Borbak-Ool (deceased), Nikolai Oorzhak-Ool and Nina Syrat were part of it. This second delegation was also accompanied by the tuvinean scientist Ljubov Tas-Ool. Rollanda Kongar was translator in both delegations. dear uktug khamnar - the shamans, that came down from heaven. yzyguur salgaan khamnar - the hereditary shamans. cher sug eelerinden khamnaan khamnar - the shamans of the earth- and water-spirits. aza uktug khamnar - the devil-shamans. albys uktug khamnar - the shamans who descendet from a witch. This small section is based on the article "Die mythischen Wurzeln des Schamanismus" by Mongush B. Kenin-Lopsan, published in the catalogue to the exhibition "Schamanismus und andere Welten". During the second visit Dr. Kenin-Lopsan allowed his materials to be used and published. I want to express my gratitude to Paul & Roswita Ussusic. Without their efforts none of these delegation would have visited Europe. Also I want to thank the tuvinean shamans for taking the efforts visiting us and share their shamanisms with us.